Enjoy the look and comfort of this beautiful hammock set. 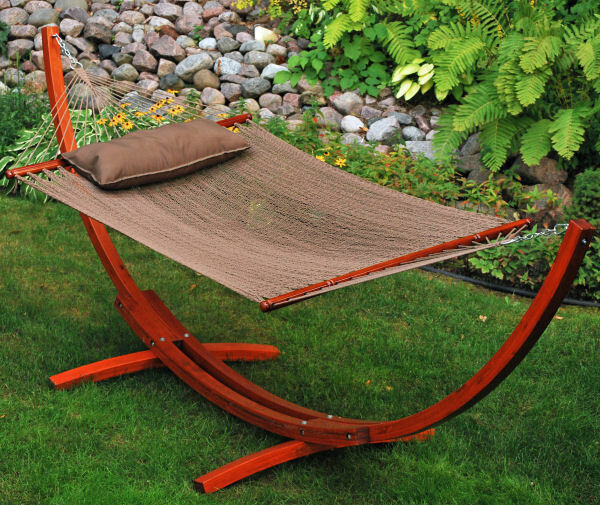 Our Caribbean hammock, matching pillow, and Russian Pine wood arc stand are the perfect combination. The stand is finished with an outdoor poly coating for long lasting durability and beauty. Our popular Caribbean hammock is made of soft polyester rope, tightly woven for a soft, stable feel. The round hand-turned spreader bars compliment the finish on the frame. The matching pillow completes the unit, and adds extra comfort to your relaxing experience.